Moray councillor Louise Laing in Provost Christie Drive, Rothes. Previously, prices were increased by between 4% and 5% a year to help fund the council’s new-build programme which adds 70 homes annually to tackle the region’s affordable housing shortage. However, due to a change in a number of factors over the past two financial years – such as lower borrowing costs and low rent arrears – the programme has been delivered without the need for further rent increases. 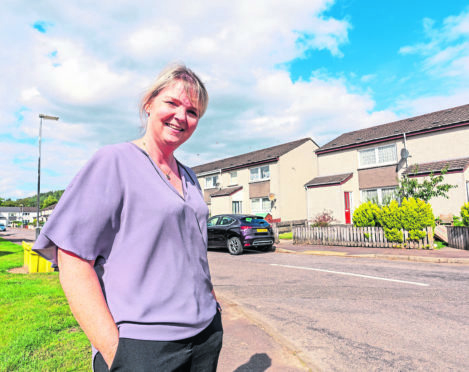 Communities committee chairwoman Louise Laing said: “While the majority of tenants previously accepted the increase on the basis that it would help fund new build housing, a recent survey showed that affording rent and heat were still issues for a large number of households. The results showed that 8.4% of tenants not receiving full housing benefit said their rent was difficult to afford, with 34% saying it is just about affordable. In addition to that, 45.2% of those surveyed stated that they had experienced fuel poverty in the last year.